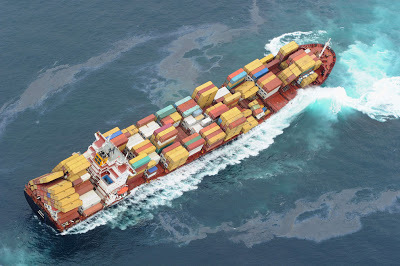 MSC is, once again, at the centre of a maritime accident, this time the the ship is the MV Rena, off the coast of New Zealand; I am sure you are aware of it by now, its still an interesting story. The ship is hard aground and listing precariously, they have lost containers over the side, with many of them washing ashore. The hull has cracked, and authorities report state that 380 tons of heavy fuel has leaked from the ship, and made its way onto nearby beaches, outside Tauranga, New Zealand. There is significant impact on the area’s wildlife. Svitzer salvage is on site, according to reports, and drawing up a salvage plan. It is clear from the various media organization and bloggers in New Zealand, that this is clearly considered a major catastrophe for the island nation. There is report that the Filipino community in the area, is being harassed due the grounding. Typically, on deep sea ships, the Filipino crew are generally all ratings, relatively far removed from navigation decisions, but that is besides the point, and shows how strong the feelings are there following the accident. 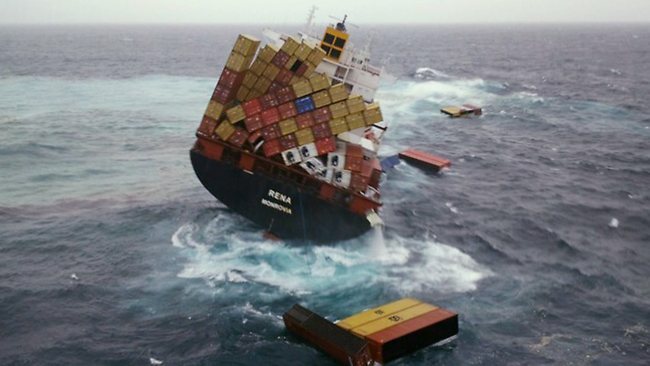 The MV Rena was classed under ABS, and flew the Liberian flag, it was most recently held in detention in Freemantle, by Australian Port State Control (PSC) inspectors, in July 2011, for no less than 17 deficiencies. The items are far more than just the typical certificate issues, a considerable amount of deficiencies in the engineering spaces, and numerous in the navigation, on top of the usual certificate issues. All point to a very good job done by the Australian, at identifying a problem ship… unfortunately, we are all to familiar with the quick band aid solutions that are then applied by the company to release its ship. But one could say that the PSC inspector in Australia, called it right, in particular with “safety of navigation” deficiencies. Less than three months later, the ship would run aground at full speed. Although the detention in Freemantle was the first in the ship’s history, it has a long history of deficiencies during PSC inspections. There is a noticeable increase in deficiencies starting 2006, with no less than 39 deficiencies in 11 PSC inspections since then. Around 2005, the ship was bought by the Offer Brothers of Israel, and run under various names, including Adaman Sea and ZIM America, for ZIM Israel. In late 2010, another name change occurred, with the new owners Daina Shipping of Greece, taking over. Costamare has issued various Press Releases, regarding the accident, on their website. You can find some great pictures of the calamity here, including the one posted above, by Mike Hewitt of Getty Images. You can visit the Maritime New Zealand’s website, for an up to date report of the clean up and salvage efforts. there is no obvious easy solution. This will be a major casualty. The Captain, who was celebrating his 44th birthday the day of the grounding, has been criminally charged, as well as the OOW. You can read previous entries on MSC, made on this blog, surprise, surprise, dealing with similar situations.